Rendering in layman terms is the equivalent of external plastering. Traditionally, rendering was used to cover poor quality external walls, but in more modern times, has become a highly decorative feature of many buildings. The picture inset is an example of a through coloured Lime Render with a scratched finish. If you require the services of a professional masonry coatings company, to render your walls, house or building and would like a free no obligation quote, simply call us on 0800 500 3146 or send us an email and we will discuss your requirements. All of the renders that we install have their own particular strengths. It is essential the correct type of render be used to protect and enhance any particular building. Using the wrong type of render on the wrong type of wall will result in failure of the render, damp problems and even possibly health problems! All too often we see the wrong type of rendering materials used when rendering walls and buildings. Here is an example below, of a failed polymer render, applied only 18months ago! This polymer render was applied to a stone building, built with lime mortar. A Natural Hydraulic Lime render is the only suitable product on this type of substrate (any professional wall coatings company would know this). The company responsible has since gone bust, therefore Avant Coatings Ltd were called to survey, determine and rectify the faults. Unfortuatley the only solution to this problem, was to replace the render entirely, costing the home owner substantially more than if they had hired a professional company in the beginning. Other typical examples include traditional buildings with walls constructed of solid stone and rubble or timber framed buildings rendered with cement render or a cement pebbledashed finish! After a short time the exterior brick or stone spalls and begins to fall apart, this in turn causes the rendering or pebble dashing to deteriorate and eventually delaminate from the substrate. The internal walls begin showing signs of damp problems with the growth of mildew in corners and damp patches on the plastering. This is caused because the cement render has a low rate of vapour exchange. All the moisture that the building absorbs from the ground or produced by cooking and washing would usually soak into the lime render (which acts like a sponge) then evaporate into the environment. Because the cement render cannot exchange vapour as quickly as lime render, high levels of damp build up within the wall structure. High levels of damp within the wall causes the external render to crack and delaminate especially during the winter months when the walls are continually freezing and thawing, eventually the damp has no choice but to vent internally. Once internal damp is evident to the human eye it is too late to cure and often the plasterwork internally needs replacing as well as the external render. Traditional rendering methods require the use in a base or scratch coat as shown in the picture left, to provide an adequate key for the top coat to bond to. One of the most important but often neglected ingredients of lime render and cement render is the type, quality and quantity of sand used in each particular type of render. Polymer renders are pre bagged in a powder format so the only thing added is clean water. The use of nylon reinforced basecoats create extremely durable polymer renders. On certain substrates a metal lath system can be used to overcome many problems and achieve greater aesthetic appearances. There are many different finishes that can be achieved with rendering, ranging from a sponged finish which is flat and smooth, a scratched finish which involves scratching back the top coat to leave a rougher finish (see first image), or even a scalloped finish which leaves visible trowel marks. There are also other types of decorative finishes achieved by using spar for pebbledashed finishes, Tyrolean or stucco for a roughcast appearance both of which are particularly useful to conceal uneven walls or alterations to a building. Some modern renders are classified as monocouche renders. Monocouche is a French word that means "mono-layer" or "one layer". These monocouche renders do not require a base coat and are most suited to new build properties. Monocouche renders are available as a lime render or a polymer render and are available in a wide range of colours. Both lime render and polymer render are available as through coloured render. Through coloured renders are pre-mixed bags of render, which are pre-coloured during manufacture. Pre-mixed renders can be spray applied saving considerable cost on labour and scaffolding hire. These renders can be particularly appealing as they do not require painting and offer long term protection on a broad range of surfaces. With the use of through coloured render an attractive pebbledashed finish can be achieved by contrasting the render colour against the colour of the spar. Traditional natural hydraulic lime render (NHL) or Lime Render as it is more commonly referred, has been used for hundreds of years across a broad range of substrates. Lime render is by far the most breathable render product available, although relatively soft, lime render expands and contracts with the building which makes it particularly suited to older buildings or wooden framed buildings. Lime renders range in strength from feebly hydraulic lime, moderately hydraulic lime to eminently hydraulic lime each having its own suitable substrate and application benefits. Chopped hair or fibre can be added to reinforce render base coats and the addition of casein which is a natural extract of cow's milk is particularly useful on difficult substrates as it acts as a plasticiser. As mentioned previously, a new breed of natural hydraulic lime renders are available called monocouche (or one-coat) systems. These are particularly suited to light weight thermalite blocks, concrete blocks and stainless steel mesh. There are also wood fibre insulation boards and insulated render coats available making lime a favourable option for an eco-friendly new build project. Lime renders should not be confused with hydrated lime products. Hydrated lime products can be found in builders merchants and are used as an additive to cement mixes to extend the properties of the cement but differ vastly from natural hydraulic lime renders. Natural hydraulic lime render, requires a high level of skill to apply them. Good mixing practices are paramount to the quality of the product. It cannot be stressed enough how important it is to use well graded, washed sharp sand or river sand in lime renders, these are usually only found from specialist high quality suppliers and are far superior to manmade sand which are manufactured by crushing stone such as sand stone. Using low quality sand, contaminated sand or soft sand results in high levels of shrinkage, cracking and spalling of the render system ultimately causing failure of the render. Lime renders are available as standard renders or thorough coloured renders in many different colours and shades. The addition of harling or spar can mixed into the finishing coat and either cast by hand the traditional way or spray applied using gravity fed hoppers. Once cured, lime renders require very little maintenance and have a very long life span. Lime renders are Eco-Friendly as they absorb Co2 out of the atmosphere while curing. When fully cured the lime render sets back to lime stone state and provides a very durable finish. Suitable substrate for Lime Render: Solid stone with rubble filled walls, timber framed buildings, straw bale constructed buildings, new builds using thermalite blocks or breeze block, clay brick built buildings, Accrington engineered brick buildings, insulated fibreboard, metal lath or wooden lath. Other substrates may also be suitable. Modern cement render is much harder and stronger than lime render. A sealed or painted cement render can benefit a building in certain circumstances by helping prevent penetrating damp. Cement renders are generally mixed using ordinary Portland cement. As these are so rigid they are not suitable to older buildings as they crack and spall in no time at all. Hydrated lime can be added to the cement mix to increase durability and flexibility of the render but it by no means cures all problems associated with cement render. Cement renders are generally a cheaper alternative to Lime Render or Polymer Renders. They are often applied as they are cheap for the builder to make and relatively easy to apply. Cement render also cures reasonably quickly when additives are used, but caution should be taken when specifying cement renders as they are incredibly rigid and will crack, spall or delaminate if there is any movement in the substrate or levels of moisture build up too high within the render. Suitable substrate: A cement render would be suited to a modern building, constructed with a double skin wall with wall ties. The wall will need to be permanently dry and free of defects such as movement around windows and must never be applied below the damp course. Metal lath is suitable, other substrate may also be suitable. Polymer renders are the most modern products in the market place and contain white Portland cement. Polymer renders incorporate silicone water repellents as an integral part of the cement based render system. This silicon technology imparts a high degree of water repellence to the render surface whilst allowing water vapour to pass through the render and lets the substrate breathe. The use of nylon reinforced base coats provides a high strength base for the finish coat. Polymer render is available as monocouche render, eliminating the need for a base coat. The monocouche renders are usually only applied to new build lightweight blocks or breeze block. Expansion joints often need to be used to ensure the render does not crack. Colour matched PVC corner beads and stop beads can be used to enhance the appearance of the render or provide a contrast. The polymer renders come in a wide range of colours and can be finished in different textures, from a flat sponged float finish or a rougher scraped finish as well as pebbledash. Polymer render are pre-blended and only require the addition of clean water to mix them. This ensures the quality of the render remains consistent and ensures a superior finish. Suitable substrates: light weight thermalite block, breeze block, modern brick, Steel framed buildings, insulation boards, phonelic insulation board, polystyrene insulation sheets and metal lath. Other substrate may also be suitable. Insulated render systems are a form of exterior wall insulation (EWI) and are a great way to cut your building carbon foot print. 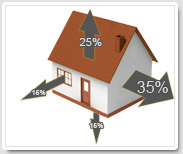 Up to 35% of heat lost is through a buildings walls! Some buildings constructed with methods such as single skin walls, solid wall construction, prefabricated concrete panels and steel or timber framed buildings are particularly suited to exterior wall insulation, as they cannot be insulated with cavity wall insulation. Exterior wall insulation is ideal for barn conversions and garage conversions as the insulation is installed to the exterior of the building so it is not taking up valuable space inside the building. There are several types of insulation material available such as phonelic board, polystyrene sheets, compacted mineral wool and wood fibreboards, all of which require a finishing coat applied to them to protect them from the elements. The rendered finishes available for the insulations are through coloured polymer render, through coloured lime render and thin coat polymer render with an acrylic finish. Brick or stone cladding can be applied to an external insulation to provide an attractive finish, see our wall cladding page for further information and examples. The insulation slabs vary in thickness from 20mm to 120mm, each have different U values (unit of insulation). Each insulation slab has to be fixed and bonded with careful consideration and skill, to ensure they are strong enough to withstand the elements. Installing exterior wall insulation needs careful planning and preparation, making sure all roof or eve over hangs are adequate, pipes, vents, extractors, window sills can be extended, as well as wires and services can be accommodated. Additionally there are several rendering products available which have insulation properties and applied like a traditional lime renders. These products have aggregates that trap air creating an insulated render system. Suitable substrates: Single skin walls, solid wall construction, barn conversions, garage conversions, timber framed buildings, steel framed buildings, breeze block, light weight thermalite block, brick, stone and prefabricated houses. Other substrate may also be suitable. Light weight thin coat render is a form of polymer render and requires sealing or coating once cured. The thin coat render is applied in two coats with the first coat (base coat) incorporating a nylon reinforced mesh, with a total thickness between 8mm and 12mm. These thin coat renders are a suitable alternative to cement render but far superior in performance and durability. Thin coat renders are usually applied to lightweight thermalite block, breeze block, concrete block, brick or insulation slabs. They are quick and easy to apply saving on labour costs and scaffolding hire costs. Suitable substrates: light weight thermalite blocks, breeze blocks, concrete blocks, brick, insulation slabs or exterior wall insulation. Other substrates may be suitable. Acrylic render is a finishing coat for render, containing aggregates to display an attractive finish. It is applied to new and existing render to seal and enhance the appearance. Acrylic render is available in a wide range of colours and textures ranging from 1mm to 3mm aggregate size. These examples show a 1mm, 2mm and 3mm aggregate respectively, having applied a plastic float finishing technique to the 3mm example. The acrylic renders incorporate anti-cracking technology by using minute reinforcing fibres to produce an incredibly tough and durable finish. The Acrylic render can be applied by a steel float or spray application. It is possible to hide small defects and alterations using acrylic render. When spray applied, a Tyrolean finish can easily be achieved. Suitable substrates: Light weight thin coat render system, cement render in good condition and good quality brick and stone.